This modern domed black aluminium angled outdoor wall light with ridged frosted glass is perfect for lighting your garden wall and outdoor areas at night. The domed half-moon shape gives it a contemporary appearance, and the ridged frosted glass shade provides a practical source of downlight. The modern outdoor wall fitting is IP44 rated and designed to withstand the elements, with a stylish cutaway strip of light at the top to complete the look. 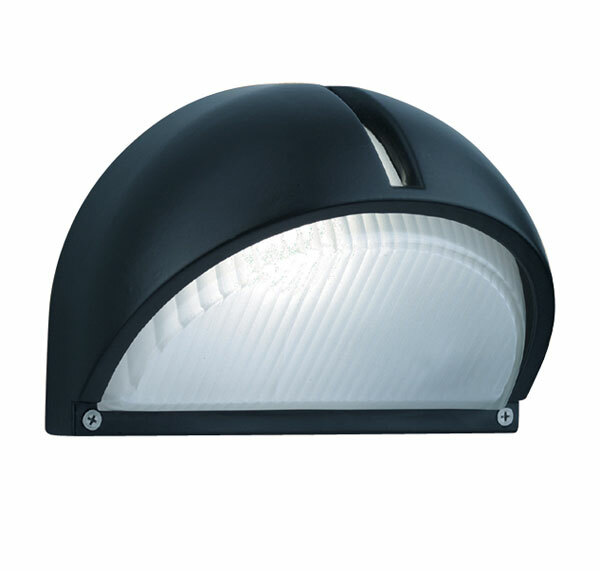 Ideal for pathway lighting or as a porch light. A black finish chromate treated cast aluminium outdoor wall light, with ridged satin glass shade in a contemporary domed half round design and angled base to direct light downwards and forwards. Please follow this link to view or download the fitting instructions.